The Public Form Editor is the editor that users without a GoFormz account can use to fill out GoFormz forms. It is similar to the Web Form Editor for GoFormz users, but with limited functionality. The Public Form Editor does not require a login, and therefore can be used by anyone with the appropriate URL. If you have a GoFormz account, click here to learn how to generate a public form URL. To access the Public Form Editor, use the URL provided to you. When you open the URL, you will see an editor like the one below, with a form in it. Editable fields will be highlighted; in the example below, the “Date” and “Reported Problem” fields are editable. To edit a field, simply click on it. Depending on the field, you will either see a cursor prompting you to start typing, or a control prompting you to select or enter data (e.g. a dropdown, date selector, signature field, etc.). See here for more on form fields. Use the controls in the footer to move between form pages, as well as to zoom in and out. Once you are done filling out the form, click the Complete button at the top to send your responses back to the form’s originator. 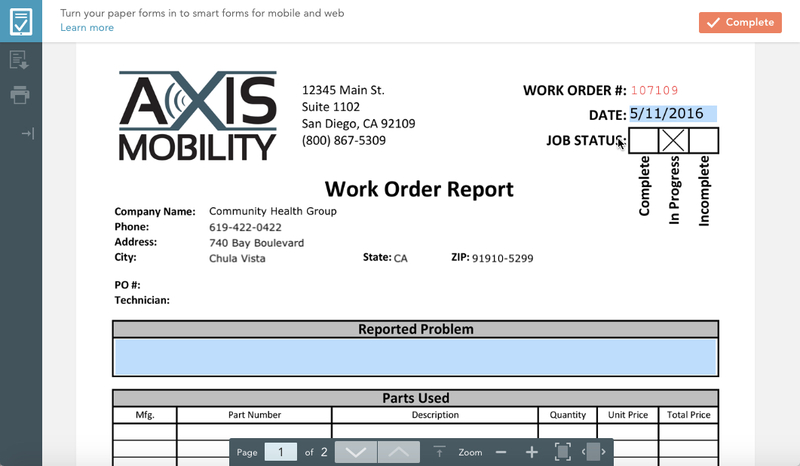 After you complete the form, you will see a screen allowing you to download or print the form for your records. Please note, Public Share links are optimized for use on a full web browser and not a mobile device.